We’re pretty happy with how our cows thrive on stockpiled forage, and these pictures show why. Thick coats, well-padded hip bones, calm, contented demeanor — these are happy cows. 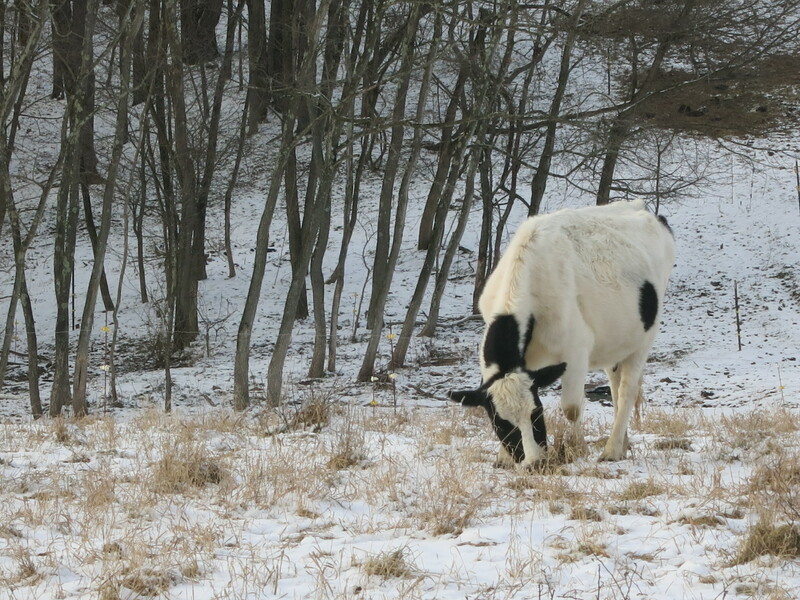 Note that these animals have spent the entire winter out in the pasture, with no supplementation except minerals, eating standing forage saved since last July/August, the only exception being a few days when there was so much ice on the snow that we fed square bales in the pasture. ‘Stockpiled forage’ means mature plants left standing in the pasture and reserved for use after the growing season. Note that we say ‘mature’ plants, not senescent or lignous. We time our summer grazing to leave half the pasture acres untouched after their mid-summer grazing. 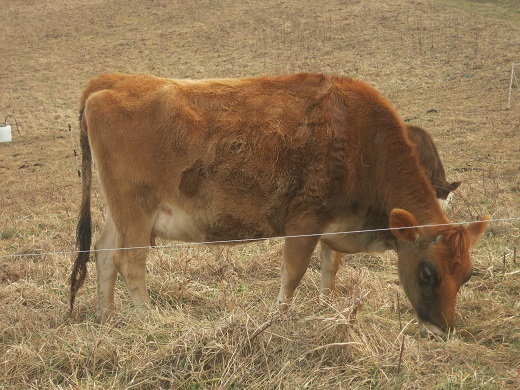 For this part of Ohio (east central, zone 6), that means that somewhere around the middle of July, or a bit later, whatever we graze over the next six to eight weeks is going to be taken out of the rotation for the rest of the growing year. About half the farm will be grazed over this lste-summer period. Then in Sept/Oct/Nov we graze the other half, leaving the earlier pastures to regrow. We’ll probably make two rotations on the part we’re not stockpiling, depending on what the weather is doing. In a perfect year — 2018 was pretty satisfactory — we’ll get some good rains and lots of regrowth, and the stockpiled pastures will be fully mature when the cold weather sets in. Then come late November/early December we finish grazing the fall pastures and start around on the stockpile. It probably goes without saying that we’ve stockpiled the pastures where we have the most frost-free water (spring-fed tanks). We don’t like permanent lanes and the impact they get, but in the winter when there’s no snow on the ground we have to leave a temporary lane open back to water. We use reels to build the lanes, and move them often to minimize the opportunity for back grazing. Some of the bunch grasses (especially orchard grass) are going to be hit too hard if the cows get bored and start lounging back toward water, so we watch for this and shift the lane fence accordingly. 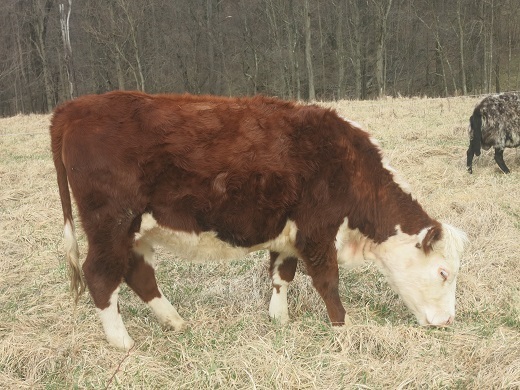 This method works well for us, and the improvement we’ve seen in our pasture composition and productivity over the last six years has been very satisfactory. 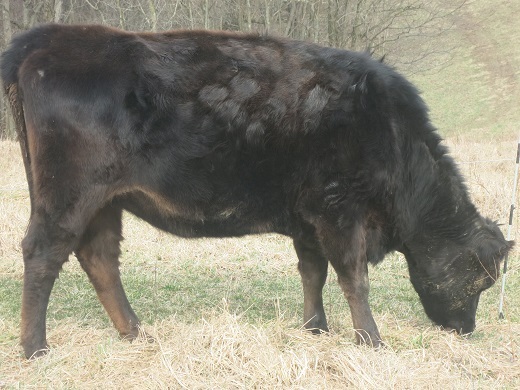 Stockpiled forage is more nutritious than hay – forage tests confirm this — but it’s also exposed to the weather; thus, to wait to feed it is to let it deteriorate. Feeding better forage first means that cattle come into the worst weather in better condition than if they had been getting the lower-quality grass. Young calves with young digestive tracts need the best we can offer them; when they are older is soon enough for managing on coarser forage. We can’t tell you what we’ll be saying in three years, but that’s how it seems to us right now. Maybe it’s the grass this year, which has been exceptionally rich and plentiful with alternate warmth and cool, sun and rain. Good grass means plentiful milk, so much we’ve had to begin making cheese twenty pounds at a time, and butter in a four gallon bucket, good things indeed. But heavy lactation right after calving can trigger calcium deficiency, or ‘milk fever’, a nuisance at best, deadly if not dealt with, and we’ve seen two cases now, two for two this month of May. We’ve got a crick from elevating i.v. bottles for twenty-thirty minutes a go, and a permanent case of the shudders whenever we see a hypodermic needle. In the case of the seven-year-old Jersey cow Poppy, it’s just not fair: we gave her prophylactic CMPK paste two days before she calved, and again twelve hours after, and still at about 24 hours she went down, and we had to drip six 500 ml bottles of calcium solution into her jugular before she shifted her freight — the first two, we might add, kneeling for an hour in a cold drizzle. Makes you feel old and experienced, and pretty triumphant, and certain you’d rather never have to do it again. Sweetheart, whose name has nothing to do with her personality, is tetchy even with her little boy Reese, and he finds it easier to get his meals from almost any other cow in the bunch than from his mama. That right back leg is just too quick to lift whenever Sweetheart feels a touch on her bag, and our guess is that he hasn’t always dodged fast enough. Neither have I; milking Sweetheart is like going out with someone regrettable who keeps trying to get his arm around your waist, only with Sh she’s trying to get a foot in the bucket. At this time of year the livestock moves over the pastures very quickly, and paddocks are consequently large, which means they take a long time to set up, so when the sleet started yesterday afternoon it caught us in the field and there was no getting away until the fence was up and the cows set for the night. Sleet bouncing off the back of our necks and a strong wind which wasn’t warm even if it was southerly, and the cows trying to make a sneak into the woods while the fence was down, and who can blame them? By the time the lactating cows were milked and put in their own little paddock by the run-in shed we were saturated, and there was rain puddling in our boots. Still — we wouldn’t trade this for anything.